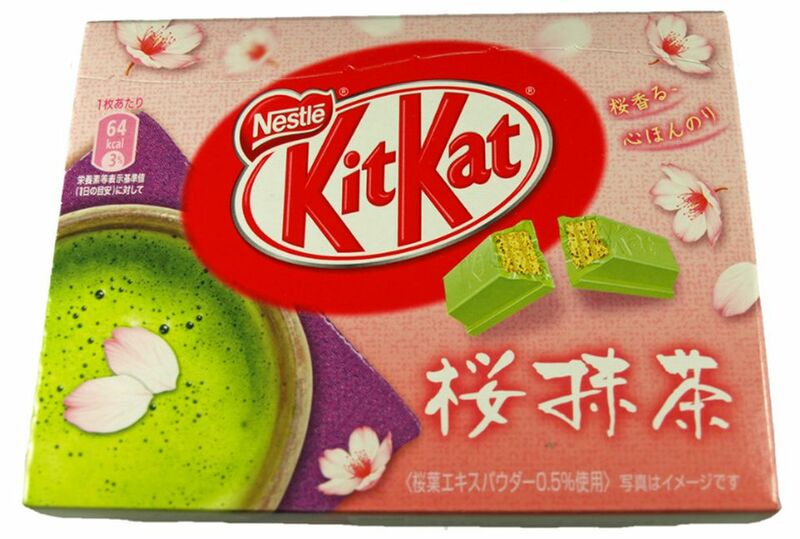 Japanese Sakura Matcha Kit Kats by Nestle are generally only available during springtime in Japan. If you love cherry blossom, green tea, and white chocolate, and you ever have access to these rare treats, you should try them out! While Sakura Matcha Kit Kats are lighter in the matcha green tea than they are on the sakura (cherry blossoms), they are a unique tea treat on their own or paired with freshly whisked matcha. Sakura Matcha Kit Kats are packaged in a glossy chipboard box decorated with images of floating cherry blossoms and a frothy bowl of matcha. On the back, there's room for gift-givers to write a thank-you note. Inside the box, there are two bars of chocolate, each wrapped in a foil wrapper that shifts from spring green to white to salmon pink. The red Kit Kat logo is emblazoned across the wrapper. The bars themselves are "two-finger" bars, the traditional Kit Kat size that has since been replaced with "four-finger" bars here in the United States. They are a muted spring green color. The aroma of Sakura Matcha Kit Kats is less matcha-heavy than the aroma of regular Matcha Kit Kats. It's also fairly floral. The flavor is a robust balance of sugar (white chocolate and sakura sweetness), spice (white pepper and cinnamon) and green (oak leaves, matcha, and fresh-cut spring flowers). Although it's quite sweet, I can safely say it's the most sophisticated Kit Kat I've ever tasted. Sakura Matcha Kit Kats are probably a little avant-garde for your average candy bar consumer, but for adventurous eaters and Kit Kat aficionados, they're a true treat. If you love cherry blossom-flavored foods or unusual Japanese Kit Kats (Wasabi Kit Kat, anyone? ), Sakura Kit Kats are a must-try.